The ESU-2400 Conmed PM Kit is a complete set of accessories needed to safely perform preventative maintenance procedures. The CONMED PM Kit works with the ESU-2400 Series of electrosurgical unit analyzers to test the CONMED System 2450 and System 5000 electrosurgical unit generators. There are four pieces to the kit, including a port adapter, 3” jumper cable, the Monopolar Handpiece Simulator and a Carrying Case. The Monopolar Handpiece Simulator simulates a monopolar electrosurgical handpiece with cut and coag buttons. 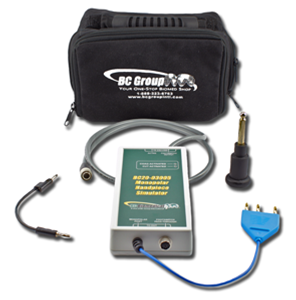 This simulator enables automation of monopolar output activation using the footswitch output of the ESU-2400 while providing a passthrough connector for triggering the generator using the footswitch port.